Introduction: Here on Earth, diamonds are found in the magma pipes that fed long-extinct volcanoes. Sometime in the distant future, the volcanic provinces of the Pacific “Ring of Fire” will be prime diamond-hunting territory. So it’s fitting that winter’s Ring of Fire is also full of diamonds, in the form of open clusters that decorate the winter Milky Way. All of the clusters described here are within reach of 50mm binoculars, although most won’t show much detail at 7-10x. Even the smaller ones will start to differentiate in 15×70 binoculars, and all of them are stunning in telescopes of any size. Instructions for M41, M93, M46 and M47: Go outside after dark, face south, and find Sirius. 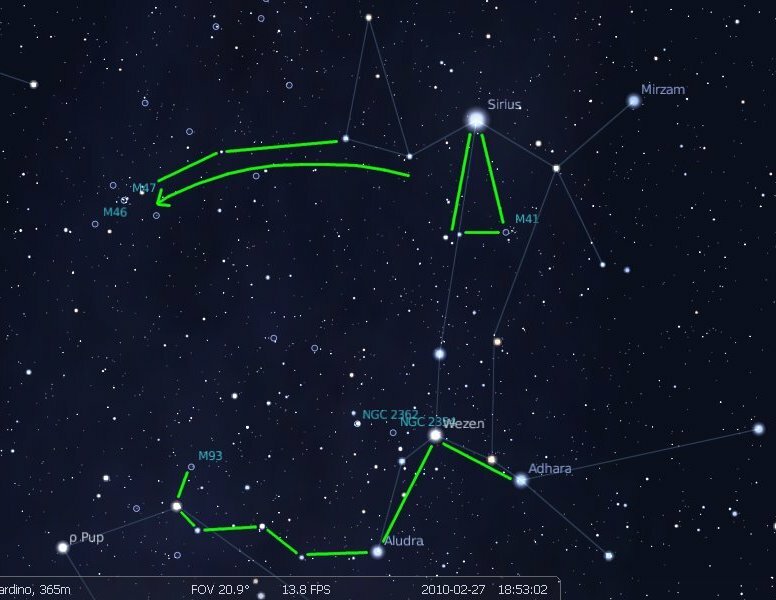 Use it to trace the “doggy” shape of Canis Major. M41 is the biggest and brightest of the clusters in this area, and it’s an easy catch right in the heart of the dog. I usually find it by centering Sirius in the field of view and then just sweeping down (south) through the constellation. It never fails to swim into view. If you’re having a hard time, M41 makes one corner of an elongated triangle with Sirius and a trio of brightish stars along the dog’s back. After M41, the rest of the Messier clusters around Canis Major may seem a bit anticlimactic, but each has its own charm and they are all well worth tracking down. And there are even better clusters to come. Although it is nowhere near as brilliant as M41, M93 is one of my favorites. It is small but fairly dense, and at low magnification its irregular shape makes me think of a silvery flame burning in the night sky. To get there, trace your way down the dog’s back to the bright stars Wezen, Adhara, and Aludra, which mark the dog’s hindquarters and tail. If you’re in doubt about which is which, note that these three stars form a right triangle with Aludra at the south end. From Aludra, a loose chain of bright stars trails east into the constellation Puppis. Sweep over and up, over and up, and you’ll see M93. If you get to a star as bright as Aludra, you’ve hit Rho Puppis (looks like ‘p Pup’ in the map above) and gone too far. The last two in this window, M46 and M47, make a nice contrasting pair. From Sirius, scan east to find the stars that make the back of the dog’s head. I imagine these stars forming one end of a shallow arc that includes several bright background stars and ends on the paired clusters. If that doesn’t work for you, use Stellarium or the atlas of your choice to pick out intermediate stars to use as waypoints. A word of caution: this is a rich region of the sky, with loads of tiny faint clusters that aren’t marked on any but the most detailed maps. More than once I have been looking for M46 and M47 and gotten hung up in the wrong place. If you have any doubt about whether the clusters you’re looking at are the right ones, they’re probably not. One way to recognize them for sure is to note the differences between them; M47 is very sparse with a handful of bright stars in an irregular pattern, whereas M46 has many more stars that are more even in brightness, although none of them are nearly as bright as the most prominent members of M47. The first time I observed these clusters, I found M37 and M36 easily and then spent almost an hour trying to locate M38. It just wasn’t there! Then I checked the descriptions of the clusters and realized that I had actually been looking at M36 and M38. I’d been extending the line in the wrong direction. I backtracked and picked up M37 easily–an illustration of why it is useful to know what things ought to look like, and not just where they are. The Auriga trio are nice clusters, but the fourth and final M-cluster in this window blows them all away. To find M35, trace down the body of the western twin in Gemini, from bright Castor to the swooping arc of stars that marks the outside ‘foot’. Just above the toe of the boot, in a right triangle with the last two stars in the arc, you’ll find M35, a big, bright cluster that rivals M41 in either binoculars or telescopes. If you’ve got a telescope, you can get a twofer–the small, compact cluster NGC 2158 is right next to M35 in the same field. It’s a tough catch in binoculars unless you’re under dark skies, but almost any telescope ought to show it easily. There’s a nice photo of the pair here. Instructions for M44: I saved the best for last. M44, also known as the Beehive Cluster or Praesepe (“the manger”), is probably the second best cluster in the sky after the Pleiades. But it’s not as easy to find. The Pleiades have enough bright stars to shine out even in suburban skies, but the Beehive is an aptly named swarm of smaller lights. To complicate matters, M44 is located in Cancer, which has no bright stars. I usually get to the Beehive from Gemini. Here are some methods that might work for you. My usual path is to draw a line from the extended arm of the western twin, through Pollux, and on in the same direction for about the same distance. Right now that line also intersects Mars, so you could cut your travel time by just drawing a line from Pollux, through Mars, to Praesepe. But that method is only going to work for a few days, maybe a couple of weeks at most, because Mars is on the move (compare its position in the map above with this shot from just a few weeks ago). 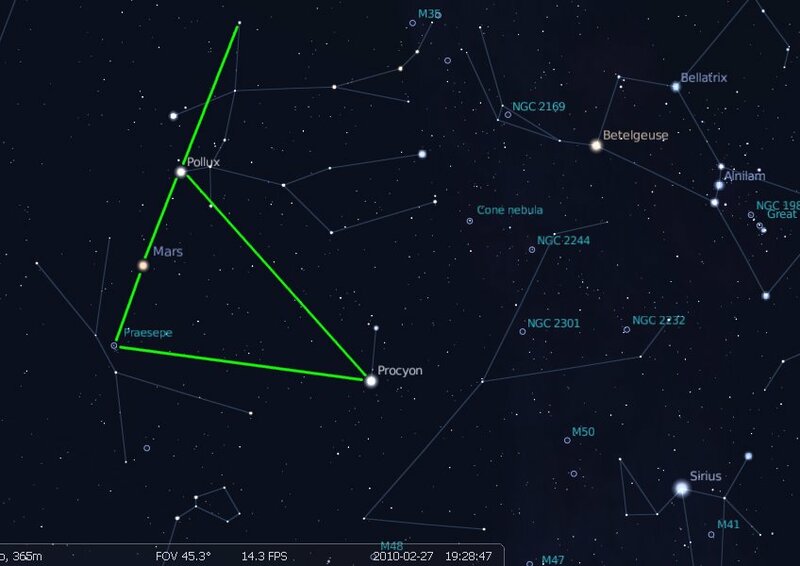 Finally, if your skies are really nasty, you might try drawing a triangle from Procyon, to Pollux, to Praesepe. It won’t be a perfect equilateral, but it’s close; M44 is just above the point of what would be a perfect equilateral. Or you could do what I often resort to when I’m in a rush: find the region between the Gemini twins and Regulus, in Leo (just off-screen to the lower left in the image above), and just sweep around with binoculars or your finder. It’s pretty low-fi, but it’s never failed me yet. M44 is a true showpiece of the sky, with dozens of stars of even brightness seemingly arranged in a net or grid. It can be seen with the naked eye under dark skies, but it really shines in binoculars. As with the Pleiades, it usually looks better in binos than in telescopes, although a short focal length, rich-field scope might have a wide enough field to show the cluster with some surrounding sky for context. Coda: The nine open clusters in this mission are just the tip of the iceberg. This section of the winter sky is littered with hundreds more. There are plenty of bright NGC clusters that rival or exceed many Messiers. The region around the ‘feet’ of the Gemini twins is an especially rich area to sweep with binoculars or a telescope at low power, whether you’re hunting for specific targets or just soaking up the view. Spring is coming. Although the constellations of winter are high overhead at sunset, they are already starting their long slide toward the western horizon. So get ’em while you can. In my first six months with my scope I spent most of my time observing the same double handful of objects. I realized that I was stuck in a rut, so one night I took Turn Left at Orion and a red flashlight out with my scope. I figured it couldn’t hurt to try. I decided to start with something I’d never seen before, but which was supposed to be easy–M41 in Canis Major. It was easy–and beautiful! I saw that M46 and M47 were a short distance away, so I tracked them down. And so it went, from one target to the next. I was too excited to linger on any one object. After a couple of hours I’d seen about two dozen DSOs that I’d never seen before. My final targets were M81 and M82. It was the first time I’d ever seen two galaxies in the same field, and it stopped me in my tracks. In the two years since that night, I’ve been back to all of those objects and many more besides. Almost every time, I notice something that I haven’t seen before. The more times I observe, the more I learn to see, the more I realize how worthwhile it is to linger on each object for a few minutes and give myself a chance to tease out its details. The objects that I found that night have become like friends. When I am in their neighborhood, I stop by to see what new impressions I will have. And then I go on to meet their neighbors down the street, and the folks on the next block over. Every observing run is an opportunity to improve my skills, to deepen my knowledge of the sky, to explore and to discover. What kind of relationship do you have with the objects that you observe? Can you remember what they look like when you’re apart? Are they unique individuals or just a long line of warm bodies? Can you point out where they live? Could you get there with a map? If someone abandoned you for a couple of hours in an empty field on a clear dark night with only binoculars or a spyglass, would that be too much time or too little? Instructions: Go to Heavens Above or fire up Stellarium and find the position of the asteroid 4 Vesta. It would be pointless for me to post a map for you, because by the time you read this, it will have moved at least a little. But do it soonish, because tonight–actually as I write this–Vesta is at opposition and thus as close to Earth and as bright as it is going to get this year. Also, right now it is cruising past the shoulder of the constellation Leo, close to the bright stars Algieba (same binocular field) and Regulus (close enough to get you moving in the right direction), which are bright enough that you should be able to see them even through light pollution. Use binoculars because you’ll want that wide field of view for sweeping from Regulus up to Algieba and then finding Vesta. You don’t need a scope for this one because there is literally nothing to see; Vesta is so tiny and so far away that you will not see it as more than a point of light. Cloudy Nights has a great article about the Collinder Catalog, a list of 471 open clusters compiled by Swedish astronomer Per Arne Collinder for his 1931 dissertation. There have been requests in the forum to post the catalog as a PDF, so I copied the list and notes into OpenOffice (which is free, and awesome, btw) and exported it as a PDF. I would have simply posted the PDF to the Cloudy Nights forums, but they don’t allow attachments larger than 124 Kb. So I’m putting it here instead. Please note that this is not my work at all; Thomas Watson did all of the heavy lifting in terms of updating Collinder’s list and turning it into a useful observing too. All I’ve done is convert it into a PDF so people can use it more easily. Update, October 20, 2010: Thomas Watson posted an updated version of the catalog which corrects some minor errors in the first version. The v2 PDF below reflects those changes. Thanks for the heads up, Thomas–and for the mountain of work! It is certainly a lovely gift to the observing community. We’ve been having lots of cloudy and rainy weather here in the LA basin, so when a clear night comes along I try to take full advantage. Last night was clear, so I grabbed my 15x70s and went out to see the clusters between Cassiopeia and Perseus. The first week of January was pretty clear here and I got through almost all of the Messier objects that can be easily seen from my suburban skies at convenient hours. No M76 or M78 yet, at least not with the binoculars (M78 did fall to my 6-inch Dob). It was enough to get me hooked on the challenge and pleasure of tracking down faint fuzzies with binoculars, so I decided to start the Deep Sky Binocular Club, too. I started that club a few weeks ago with what western objects I could get, before they get too close to the sun, or more depressing yet, too far down into the LA light dome (I’m at the far eastern edge of LA county). Then I went on through Orion, Lepus, Puppis, Gemini, Auriga, Taurus, and so on. A couple of weeks ago I was looking at my tally and realized that I’d gotten so busy with the southern stretches of the winter Milky Way that I’d forgotten about the circumpolar constellations! 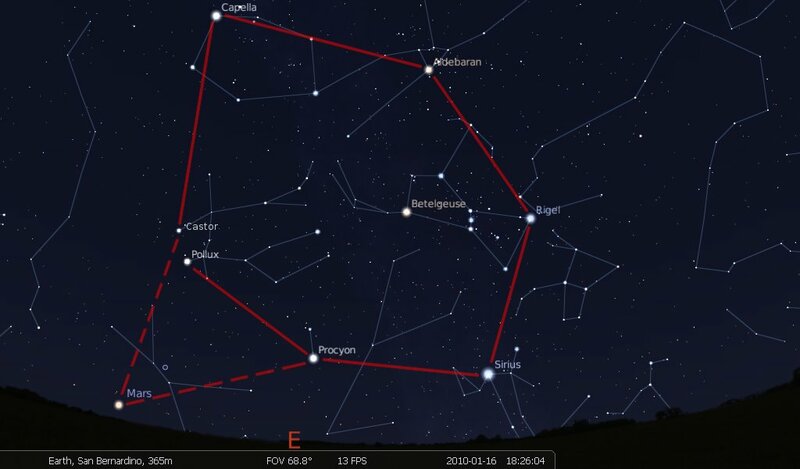 Which is a shame, Cassiopeia was the first constellation I learned when I got into amateur astronomy in earnest, and was a frequent stop on my earliest observing runs. And the stretch from Cassiopeia to Perseus is huge for the Deep Sky Binocular Club, with about a quarter of the objects on the list. I didn’t realize that until I’d gotten through most of the rest of the evening sky and was wondering why my tally wasn’t higher. Then I “discovered” how crucial Cass and Perseus are. As I compose this, it is raining. But last night was clear so I went cluster-hunting. I live in a back house with a big open parking area between it and the front house. This affords a decent bowl from which to observe without too much interference from local lighting. I usually wear a dark hooded sweatshirt and pull the hood up over my face so only my eyes are showing. With patience and good dark adaptation I’ve seen some things that I would have thought impossible in these skies, including the M galaxies around Canes Venatici and the Crab Nebula. I didn’t start off with the Cass clusters. I wanted another crack at M78, and while I was waiting for my eyes to settle into observing mode I swept up M42 and M43, M35, and the Auriga M clusters. All very pretty, but they didn’t help M78 appear out of the murk. Sometimes right after a rain the transparency is just shocking, but sometimes there are mixed clouds and haze that really put the hurt on the faint fuzzies. Last night was one of those nights. M78 will have to wait for darker skies (maybe this weekend). Tr 2 – Two chains of faint stars intersect to form the shape of a flying wing. Delicately beautiful. Stock 2 – Extremely large, vase-shaped assemblage of faint stars. IMHO, rivals Double Cluster in binoculars, although its appearance is very different. Markarian 6 – Dense patch of light, no granularity, makes a nice contrast with nearby Mel 15. Melotte 15 – Larger and sparser than nearby Mark 6, but with more bright stars. Reminds me of a hybrid of the Double Cluster clusters. NGC 663 – Obvious and granular even in these skies, brighter than nearby NGCs and even M103. Kemble’s Cascade – Lovely curving chain of stars of varying brightnesses, anchored by NGC 1502 on one end and a counter-curving arc of bright stars on the other. Bright stars plus cascade make extended S shape. Stock 23 – Jumps right out even in the surrounding rich starfield. Dominated by four bright stars in a flattened kite shape. Cr 463 – Large aggregation of faint stars, smaller and dimmer than Stock 2, in a nice trapezoidal asterism not far from the pole. All of these bizarre designations are explained in the official AL Deep Sky Bino Club list, and all of the listed objects are easy to find in the Pocket Sky Atlas. I’d also tried for NGCs 129, 436, 457, and 7789, but didn’t pick them up. I think it was partly sky conditions–Cass was getting down into the LA murk–and partly observer conditions. I usually refuse to give up on something unless I have really put in the effort, maybe half an hour of laying flat on my back with every surrounding glint of light blocked out and lots of searching with averted vision. But last night I was cold and tired, and didn’t spend more than 4 or 5 minutes on any one thing. Still, I ended the night with 10 more objects knocked off the Deep Sky Bino Club. The clouds can do whatever they want today, I’ve got a little victory energy to run on. Here’s one of those “How did I not blog about this sooner! ?” things: Heavens-Above.com. If you’ve heard of it before, it’s probably for the International Space Station flyover predictions, which are indeed great. But the site has loads more useful stuff; it’s basically one-stop shopping for the shallow sky* observing. *If deep sky objects are multiple and variable stars, clusters, nebulae, and galaxies, then shall0w sky objects are those within the solar system–planets and moons, comets, asteroids, and artificial satellites. First off, loads of info on how, when, and where to spot artificial satellites, including the ISS, Hubble, and Iridium flares. 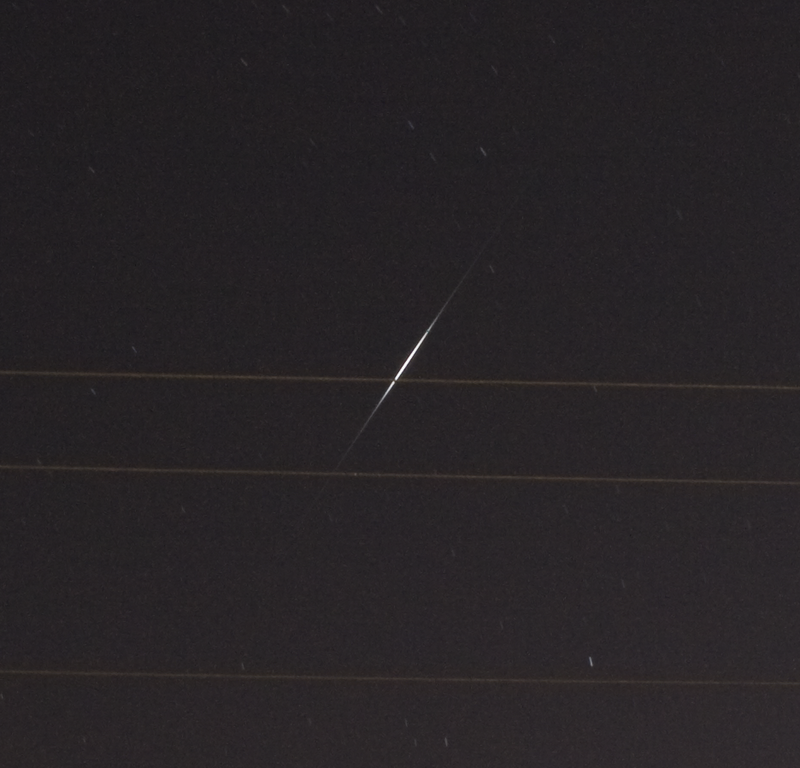 Iridium satellites are part of a big fleet of communications satellites. They have absolutely immense solar panels that produce extremely bright flashes of light, called flares, when they fly over. And there are dozens of these things in orbit, so they fly over fairly often. Flares often get as bright as magnitude -8, and sometimes hit -9.5, which is many times brighter than any planet under any condition, and almost as bright as the first quarter moon. Heavens-Above will tell you when and where to look, you just have to register (free) and put in your location. Second, finder charts for the brighter asteroids and whatever comets are currently within reach of amateur equipment. If you’re working on the AL Galileo Club and you’ve been sweating how you were going to finish the comet observation requirement, here’s your ticket. Third, loads of data on the Sun, Moon, and planets, including a cool solar system chart that shows where all the planets are in relation to each other right now (incidentally, this chart shows at a glance why we’re as close to Mars right now as we’re going to get on this pass, but not nearly as close as we get on other passes). 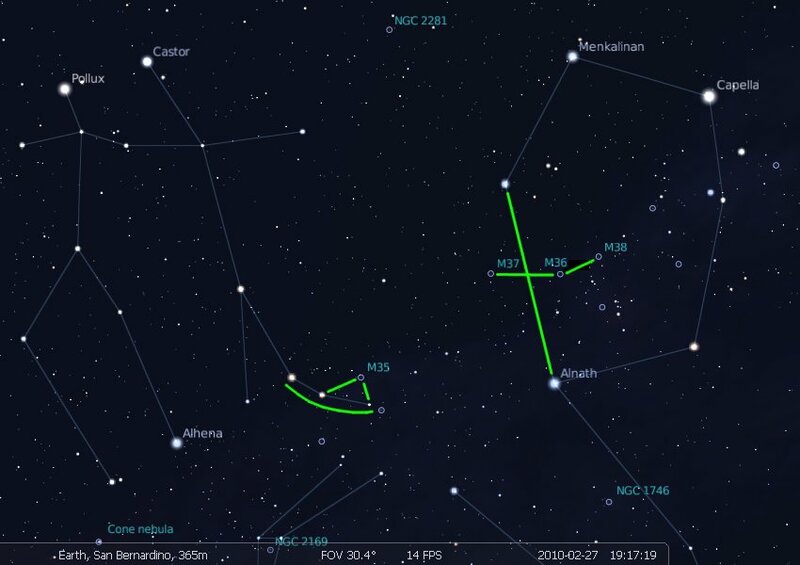 Fourth, an all-sky chart that shows what the sky looks like over your head, right this minute (weather notwithstanding), plus cool charts of all the constellations. Fifth, whatever other goodies may be lurking in the links I haven’t gotten around to clicking yet. Seriously, just go there, register, and start playing. It was BRIGHT. The prediction was for -8 magnitude, as we were only 2.5 km off the center of the flare, and it was every bit of that. We weren’t sure what to expect, but it did NOT disappoint. I set the camera up for a long exposure. This was 99 seconds at f/11, ISO400 at 18mm. I cropped the one pic down to this, the other’s a small version of the full-width shot. I had the lens as wide as I could get, because I didn’t have much confidence it my aiming. But now that I know that with the compass and clinometer apps being this accurate (as you can see how close to center it was) I’ll zoom the sucker in next time. Anyway, it was cool as hell to see. Sydney [his daughter] really seemed to get a kick out of it (it was REALLY bright and easy to spot). It was a fun thing to get us all out on the back porch for. That’s his photo at the top. Now you know what you need to do…whaddaya waitin’ around here for? You are currently browsing the 10 Minute Astronomy blog archives for February, 2010.